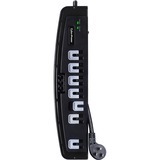 The CyberPower Professional Series CSP708T Surge Suppressor is ideal for Home/Office protection with 1650 joules, 7 outlets, RJ-11 (1 in / 2out) phone line protection, and a 8 FT cord. The surge suppressor is ideal for protecting personal computers, phones/fax/modems, printers, stereos, and consumer electronics. The CSP708T features (7) outlets with (1) widely spaced outlet, MOV technology to guard the surge suppressor and connected electronics against line abnormalities and lightning surges, while EMI/RFI filters block unwanted line noise. Data line protection is provided via RJ-11 ports for telecommunication devices such as phones, faxes, modems, and DSL lines. The 8 Ft. power cord includes a right angle plug with a 45° off-set for convenient installation in the tightest of environments. A Limited-Lifetime Warranty ensures the highest quality standards in design, assembly, material or workmanship and further protection is offered by a $125,000 Connected Equipment Guarantee. Built-In Automatic Shutdown - In the event of an overload that exceeds the unit's ability to suppress the signal, the surge protectors' 15A circuit breaker will automatically switch off to protect all connected electronics. Data Line Protection - RJ-11 ports (1 in / 2 out) provide surge protection to insure telecommunications devices such as phones and DSL modems work flawlessly when power events occur. Keyhole Slots - Mounting slots enable the surge protector to be mounted on a wall, under a desk, and in other configurations to optimize space and keep your power cords out of the way and organized. ISO & Safety Certifications - All CyberPower's manufacturing facilities are ISO-9001 Quality Tested. CyberPower's products are also UL Listed and CSA Certified. Sturdy Case - Constructed of impact-resistant material for maximum durability.